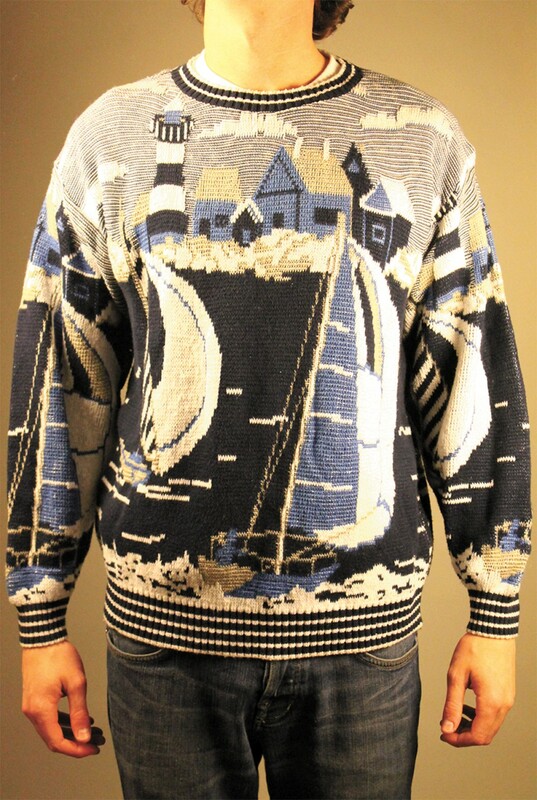 An actual sweater available on the site: "If you like sailing and sweaters then this piece is for you." He said school was a lot like riding a stationary bike. He'd pedal faster, work harder and still not get anywhere. So 22-year-old Connor Simpson dropped out of Whitworth University and visited a Lutheran monastery in Michigan. Two weeks later, Simpson emerged with a vision — he wanted to make bartering cool again. He didn't go to Michigan planning on starting a company. At that point he was trying to figure out whether he wanted to keep working at GreenCupboards (which acquired an online competitor earlier this year and now operates under the corporate name etailz) or get another job. A monk at the monastery, Rev. John Cochran, pushed him to think bigger. "He thought I had more to offer," Simpson says. "He wanted me to sit down and meditate and think about what I'm passionate about." Simpson is passionate about sweaters. At that point, he says he had more than 60. He was known around Whitworth as the sweater guy. He was running out of closet space, but still wanted more. So he looked online to see if there was any place where he could trade sweaters. There wasn't. "So I kind of playfully wrote a business plan," he says. The idea was simple. An online store where you can view others' clothing — known as closets. If you see something you like, you can propose a trade or buy the item outright. He pitched it to family and friends and responses were positive. In the spring of 2012, he entered Spokane Startup Weekend and won the Best User Interface and Design category. Using that momentum, Simpson recruited three others, promising only equity in the yet-to-be-established business. "We kind of just started working out of my basement," Simpson says. "We had a lot of creative energy. Planned out a lot of the things we wanted to do with the company, wrote the business plan, things like that." After a brief attempt at trying to write their own code for the website, the three pitched their idea to the Spokane Angel Alliance and got $100,000 in seed capital. Simpson's father Tom is president of the Alliance and a co-founder of etailz. Simpson says his dad told him he would invest the equivalent of the money he would have been spending on tuition. Three other local businesspeople invested as well. That allowed Simpson to hire Limelight Marketing Group to build the website. The beta site went live on June 20. Barters Closet now has about 300 users and 800 items. Simpson hopes to expand the scope of the site, eventually making it possible for users to trade anything — even a hammer for a sweater. Philip Glenn, 21, says he spends more than 50 hours a week doing graphic design for the company. Glenn, who started in April 2012, says it was the company's concept that hooked him. "I like alternate methods of getting what you want," Glenn says. "Instead of spending money to get something, I like the idea of being able to trade something for it." Barters Closet is designed with different types of people in mind, Simpson says. For now he's focusing on college students looking to change their style, parents with growing children, and dieting and gym groups. He says the website is modeled after online social networks, so relationships and trust can be built up.